Submitted by PMcCool on January 24, 2015 – 1:21pm. I’m back from a week’s vacation in the San Diego area with my wife, her brother, and his wife. We did a lot of the touristy things, including the zoo, the Midway aircraft carrier tour, watching sunsets from the beach, whale watching, Balboa Park, museums, eating some fabulous Mexican food and seafood, horseback rides, and a vineyard tour/tasting. Each of us came away with our own set of highlights from the trip but one of the best for me was spending a good chunk of this past Wednesday visiting and baking with Stan Ginsberg at his home. Prior to leaving on the trip, I had contacted Stan about the possibility of meeting while we in San Diego, thinking that it would be pretty cool just to stop by his warehouse to say hello and chat a bit. 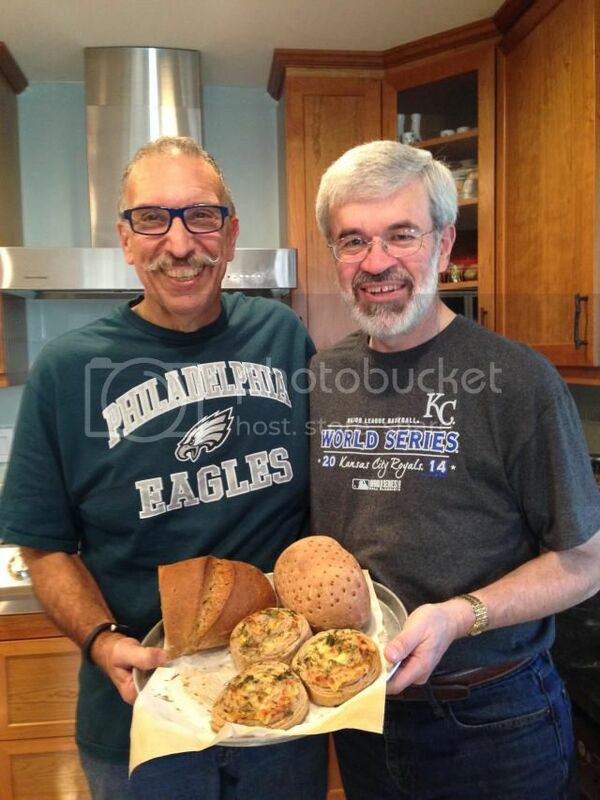 Stan proposed a better option in his reply: how would you like to spend some time baking together? I was happy to accept and, after he addressed his wife Sylvia’s concerns about letting someone they’d never met in person into their home (she is a sensible lady), we agreed that I would drop in at 10-ish Wednesday morning for some baking. And so I did. Stan and Sylvia are both outgoing people and we were soon at ease with each other. Stan had a couple of sponges bubbling for some rye breads that hadn’t been in the test bakes for the new book he is writing. I need to digress at this point to mention that the slate of 90 recipes that went out to the test bakers is not an exhaustive sampling of the rye bread world. Stan continues find more breads from a broad range of sources. It doesn’t hurt that he is fluent in German and able to translate some of what he finds. He also has a network of friends and acquaintances who can help translate bread formulae from other languages. So, the three breads we baked Wednesday were possibilities that Stan is considering for inclusion in the book. One, a filled roll made from a laminated dough, absolutely deserves a place in the book. And I’d say that the other two are also worthy. As a matter of fact, I’m still savoring the flavor of the grilled turkey and Swiss cheese sandwich that I had for lunch today made with one of the breads. Somewhere around 2:00 in the afternoon, with most of the work done and bread cooling or about to come out of the oven, we cleared away the bread-making paraphernalia and Stan set up a lunch consisting of various cheeses and breads and crackers. It was just the thing to cap a delightful visit and bake session. The rest of my group came back for me around 3:00 and I regretfully said my goodbyes, leaving with bread in my hand, happy memories in my head, and a smile on my face. Many thanks, Stan, for such a pleasant visit.